The United Nations chief will join the final day of peace talks on Thursday between Yemen’s warring parties that have brought agreement on reopening Sanaa airport and restarting oil exports but no deal on a strategic Red Sea port. Western nations are pressing the Houthi group and the Yemeni government to agree confidence-building steps for a political process to end the war that has killed tens of thousands of people and pushed Yemen to the brink of famine. The two parties have not agreed on the status of the Red Sea port of Hodeidah, a lifeline for millions, which is the thorniest issue along with a transitional governing body. 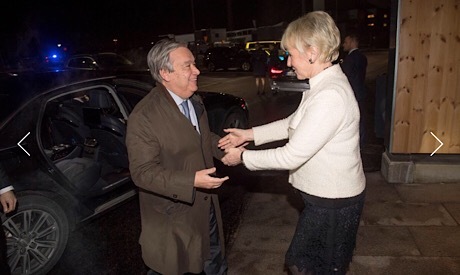 UN Secretary-General Antonio Guterres arrived late on Wednesday in Sweden, where the talks are being held. He and his special envoy, Martin Griffiths, are due to announce results of the UN-sponsored talks, the first in more than two years, and a date for a new round of consultations. The Houthis control most population centers, including Hodeidah and the capital, Sanaa, from where the group ousted the government of Abd-Rabbu Mansour Hadi in 2014, leading a an Arab coalition led by Saudi Arabia and the UAE to intervene in 2015. Both sides had received from the United Nations a “final package” of agreements on the status of Hodeidah, Sanaa airport, supporting the impoverished country’s central bank and a political framework. Sources familiar with the talks said they had agreed to reopen Sanaa airport with international flights stopping at government-held airports in Aden or Sayun in the south for inspection before flying in or out of the capital. The United Nations would oversee safety procedures, a Houthi delegate said. Deals were reached for a prisoner swap and resumption of oil and gas exports to help shore up central bank coffers. Revenues would be used to pay salaries across Yemen, delegates said. Griffiths is trying to avert a full-scale assault on Hodeidah, where coalition forces have massed on the outskirts of the port that handles most of Yemen’s commercial goods and aid supplies. He has proposed that both sides withdraw from the city and place it under control of an interim entity with international monitors deployed. The parties agree to a UN role in the port, the Houthis’ main supply line, but differ on who should run the city. The Houthis want Hodeidah declared a neutral zone, while Hadi’s government believes the city should fall under its control. Guterres called Saudi Arabia’s Crown Prince Mohammed bin Salman on Wednesday to discuss Yemen, state media said. The US Senate voted on Wednesday to move ahead with a resolution to end US military support for the Saudi-led coalition in the war.